Does 1000 go into 24? Some time ago we were told that one of our colleagues, Simon, had been diagnosed as having a rare disease called Lupus. Shortly after this, he suffered a stroke which robbed him of any chance of ever returning to the teaching job he loved so much. We made the decision at the College to try to raise some money for Simon to help him in these difficult times as, at 28 years of age, any pension he receives will be almost insignificant. I decided that I would try to do a sponsored motorcycle ride by Gold Wing, attempting to do 1000 Miles in 24 Hours. The most I had ever done before was about 640 miles on the Continent, from breakfast to bed-time and reasoned that the other three or four hundred must be possible in the remaining 12 hours. All of this happened in mid September, so I had only a short period of time to organise sponsors, decide strategy and plan possible routes before the snow and ice threatened. My first thoughts were to travel North into Scotland as far as I could on reasonable roads and then turn around towards home, then perhaps have a short trip out East to complete the distance. Watching the weekend weather forecast in late September indicated that there was a likelihood of ice in the Glens and that the gritters would be busy! Now I normally wouldn't bother too much about this but even I didn't fancy hundreds of miles of the stuff when I would be quite tired anyway. Plan B was hastily drawn up and meant riding East then South on little else but motorways, returning West and then North, which did not exactly fill me with enthusiasm but I had promised to do it, hadn't I? During the following week, I spent some time preparing the bike ( a 1988 1200 Aspencade) and re-Nikwaxing my boots, leathers and gloves. It had been very windy during the week but the winds were easing and it was supposedly warming up towards the weekend and would be very close to a full moon - very welcome if the skies ever cleared! Plan A was brought back out as the temperatures forecast were similar all over the country. I decided that alternate petrol stops would include a light meal and at least a half decent rest and that the other stops would give time for a snack and a short walkabout. I set off at twenty past six on a very wet Friday evening in October, and made my way through Preston and out onto the M6, to the North of those horrid roadworks. It took some time for the adrenaline to subside, along with the slight nervousness. I don't really know why this should have been, as I have ridden all over the Country and the Continent at all times of the day and night and have never quite felt the same before. The roads were very wet but at least it wasn't raining as I pressed on towards Lancaster. The rain started over Shap and the gusty south westerly made progress a little difficult for the next half hour or so. As I joined the A74, the gusts became less frequent and thankfully less severe and the rain also gave up. I pulled into the Cairn Lodge Services for fuel at just on 9 o'clock with 160 odd miles done and the rain again coming at me like horizontal tent poles. After fuelling up I repositioned the bike in a drier area of the forecourt and rummaged in the pannier for a hand towel to wrap around my neck over my leathers but under the reflective jacket, as I didn't fancy having water dribbling down inside my clothes all night! I had packed two towels for this purpose; they certainly keep you comfortable in these conditions and prevent draughts too. I had a large chunk of fruit cake and a drink and then carried on to do the remaining miles to Glasgow and onto the M73 towards Stirling, where the roads were again dry. I knew that the road from Perth to Aberdeen was now entirely dual carriageway and would allow me to sustain a good average speed; so I figured that this would be another convenient place to refuel and rest, probably around midnight! I was really pleased to see the welcoming lights of the B.P. station at Cocket Hat in Aberdeen, but the confounded switch machine wouldn't accept my card! so I had to use a credit card. After filling the tank, a young lad on a nifty fifty wandered over to look at the Wing and passed a comment about the G.B. badge and asked if I had been abroad on it and during the ensuing conversation he said that I sounded as if I was from "down south" (I suppose that when you live in Aberdeen, almost everyone is from down south!). He asked why I was up there and I explained that I was on a sponsored ride, trying to do 1000 miles in 24 hours. I could see that he was thinking about this and he suddenly said, "Bloody hell, it's taken me a year to do that!" through Contin and Garve, and this really gave me the injection of enthusiasm I needed. Reaching four hundred miles was a real psychological problem - it was one o'clock in the morning: I had another six hours of darkness to peer into and still another six hundred miles to go!! Why on earth am I doing this? -- Simon -- carry on. I re-fuelled again in Inverness after only a hundred or so miles as I felt sure that there would be nowhere open in Ullapool (I did have a spare gallon in a can in the pannier, just in case, but that might hardly be enough). 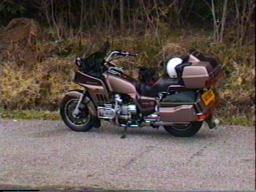 The ride out to Ullapool was incredible and one which I will never forget. The A9 over the Black Isle Bridge was very quiet except for a couple of Patrol cars and in no time I was Winging my way along the very well surfaced A835 under a 'Bombers Moon'. I travelled the whole length of this road on main beam and saw not another soul ( thank goodness I had borrowed a mobile 'phone!). I pulled into the Ferry terminal carpark in Ullapool at three minutes to three in the morning with five hundred miles (all but a tenth) showing on the trip. I wandered, elated, along the front for a few minutes and then back to the bike for another chunk of fruit cake and a brew. Must find a loo! For the non Aspencade owners reading this I must say that it really is a great help having the digital instrument panel with the two trip recorders, as you can use one for petrol mileage and the other for the accumulated distance and just for fun you can change over to kilometres, as they disappear quicker! (yes, I know there are more of them, spoil sport!) I wonder why Honda never fitted this system to the 1500's? Just one of the factors which has made me keep the 1200 for so long. As I clicked the bike into first gear to leave Ullapool, it occurred to me that the road up to Invercassley via Ledmore junction and down to Bonar Bridge would put another few good miles on, but the thought of lowering my average speed so much made me retrace my route to Inverness and this provided me with another memory which will linger for many years. A few miles before Braemore Junction, a deer ran across the road some distance away; then, as I rounded the next bend there was another standing side on in the road looking towards me. I came to a gentle halt and flicked the kill button (to stop the engine, not for venison stew!). We both sat there staring at each other for what seemed like many minutes but I'm sure would only have been a few seconds. I thought about trying quietly to get off the bike to take a picture, when, slowly and very gracefully, it turned and made off towards the trees, seemingly hanging in mid - air, as it jumped over a small fence and away into the darkness. A few miles further on, I drew into the deserted car park at the Corrieshalloch Gorge as I still needed the loo, only to find that this one too was locked - hey ho - plenty of trees anyway! As I stood next to the bike in the moonlight, there was a cracking sound behind me, which brought up the hairs on the back of my neck (about the only place they still grow!) then a large, bushy tailed feral cat shot across the car park, down the banking and out of sight. Phew! that was a relief! Whatever had been behind me had sounded larger than that. The next few miles were quite uneventful but the bike and I were in our element, using every available piece of Mr Macadam's wonderful invention, accompanied through the stereo by Ralph McTell and John Denver. I didn't think it wise to play too much "middle of the road" music, just in case there was some other fool coming the other way doing the same thing! As I came to the Dingwall roundabout I was doing a quick mental calculation of the mileage to go and estimated that I might be 70 or so miles short of my target by the time I got back to Southport. There was a patrol car parked at the edge of the road and I actually went round the roundabout twice until I had reached a decision about where to go next. I thought it would be better to do the extra distance up here rather than have to go past the road back home when I would be really worn out, so I took the A9 north towards Wick and went up as far as Tain, on the Dornoch Firth. The only problem with that decision was the presence of hundreds of rabbits scooting about all over the bits of road that I wanted to use! This made progress a little slow as quite apart from not wanting to kill or injure any of them, I certainly did not want to risk sliding down the road on my backside on freshly - squeezed rabbit. On returning to the Dingwall roundabout some time later and going round it twice again until I had made my mind up, the policeman was still parked there and did the usual double take and probably vowed never to touch a drop ever again! I refuelled again in Inverness and made my way onto the A9 towards Perth. This next section was probably one of the most boring bits of the whole ride, especially the Aviemore - Newtonmore stretch; there was almost no other traffic and a mixture of single and dual carriageway for what seemed like an eternity. I made frequent stops to jog up and down the many lay - bys to keep the circulation going, have a quick bite to eat and to change tapes occasionally. Despite the boredom, I always really enjoy that part of the night where you are suddenly aware that you can see progressively more of the surrounding scenery as it starts to get light, not in a smooth linear way but in little steps and I've often wondered what causes that effect, perhaps one of you scientific types can tell us about it? The traffic also started to thicken (in volume, as well as stupidity!) and this helped with the concentration and I began to realise that success was certainly within my grasp: a much better feeling than at one o'clock in the morning. I picked a nice little route from Perth to Stirling which took me along the old A91 through places with wonderful sounding names like Yetts O'Muckart, Tillicoultry and Menstrie, where I refuelled again and had a quick wash and shave to freshen up. I think that the lady in the petrol station must have thought I was some kind of up-market motorised tramp, as by now the white towel around my neck was almost black and the bike didn't actually look pristine anymore. I wondered where the muck came from as I hadn't really been following very much other traffic since Glasgow the previous evening. It was raining quite heavily as I left the filling station but I still enjoyed the run down to the M73 and it was warming up as I battled with another problem now, the low sun in front of me on a very wet road! Even with sunglasses I wished that I'd had the old gradient-tinted visor from my previous helmet, without its ZA marking -- thank you, legislation! This lasted for the next half hour or so until the sun moved a little and the road curved away slightly. I pulled in for breakfast at Abington on the M74 and had a really good feed and stopped for almost an hour, spending some time cleaning the windscreen and lights and reorganising the panniers and top box. I did some quick calculations here and thought that I might still be a few miles short of the distance when I got near home, so at the end of the M74, I made a slight detour to visit some friends in Carlisle. When I turned into their drive, John's garage door was open and he was tinkering as usual, but this time with his latest acquisition -- a very nice early CB750, a K2 model. Who would have thought, twenty years ago, that we would be collecting and restoring Japanese machines? I stayed for nearly an hour and had another brew and some of Lynn's excellent home baking. As I joined the M6 there was a fair amount of traffic, which kept me alert and I had a very brisk ride home on drying roads, which produced that familiar strange smell of muddy water drying on the exhaust down pipes. I pulled into our driveway at four minutes past two in the afternoon to a tumultuous welcome by the assembled masses (well, Chris was there anyway and I think I saw a cat under her car!) I was very pleased to have succeeded at my first attempt, and had no real problems, with either tiredness or the bike. Firstly, the reason for setting off at such a strange time was so that I would finish the ride in daylight and the decision not to stop for sleep was because I didn't want the added pressure of finishing exactly at twenty-four hours, when the temptation to travel too fast near the end might be too great. Mileage on speedo: 43532 with a full tank of fuel. Total distance: 1007 miles in just under 20 hours including stops. I used around 23 gallons of fuel which averages out at about 44 mpg.